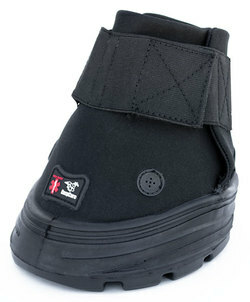 Over the last couple months our med/therapy boot has evolved and we have internally gone through several names. After some brainstorming we finally have a name that we believe is perfect. Easyboot Rx. The Easyboot Rx is just the prescription for horses requiring a therapy boot that offers stability and support without being heavy or clunky. Veterinarians, hoof care professionals and horse owners alike rely on the Easyboot Rx to help horses heal and recover quickly. It provides support and relief for horses suffering from chronic lameness, laminitis, founder, navicular and other lower limb/hoof problems. The Rx is an excellent choice for those horses that simply have difficulty standing on hard surfaces for extended periods of time. 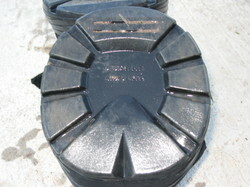 The boot can be used to speed recovery and offer protection after surgery or injury, lessen fatigue and add protection during trailering as well as offer a safeguard in the breeding shed. I received a couple of the new Easyboot Medical/Therapy boots over the weekend and put them to a really good test on Sunday. Although the Easyboot Med/Therapy boot won't be intended for turn out I wanted to see if there was any ill effects from using them on a horse that was moving a great deal in a more open area. The intention of the Med/Therapy boots will be for chronic lameness, severe laminitis, surgery recovery, transportation and breeding. I fitted one of my horses with the new boots and moved him from a 2-3 acre paddock to a 1/2 acre paddock. I wanted him to move around but didn't want him moving with his three buddies. When I turned him into the smaller paddock he galloped off and ripped around for 5-10 minutes. Not really the intention of the boots but didn't want to interfere with a more rigorous test. The boots survived the 10 minutes of chaos and I turned in for the night. Several times during the night I heard the horse fitted with the test boots whinny as he was obviously upset about being away from his buddies. Early this a.m. I went out to see how the horse and boots were doing. I immediately grew concerned when I saw that the horse paced the fence lines all night and put a bunch of miles on the boots. As I got closer to the horse I could see the boots were all in place, straight and fitted well. The boots were very dirty and muddy from the night of pacing. Despite the dirt and mud the padded uppers on the boot were in perfect condition. The real test would be to see how the new cushioned sole fared. After removing the boots and giving them a quick rinse I was a bit stunned to see the soles showed little to no wear. Not only do the new soles provide excellent cushion and support for the laminitic horse but I believe they are going to wear very well. I'm excited about how this boot is progressing. Now we have to think of a good name. I'm thinking Easyboot Soothe or Easyboot Plush. 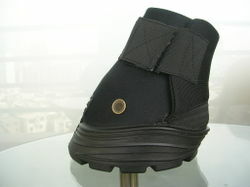 The Easyboot Medical/Therapy Boot continues to move forward and improve. We opened up a whole new set of molds and changed the bottom design. The new molds allow us to make the sole from a softer material. 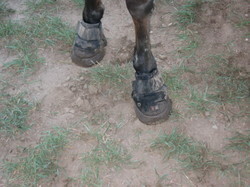 The softer material should really help horses with extreme hoof discomfort get up and moving with less pain. 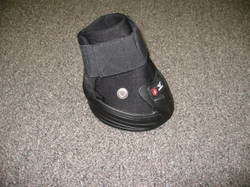 We have had some internal concerns regarding possible heat buildup with the new EasyCare Med/Therapy Boot. 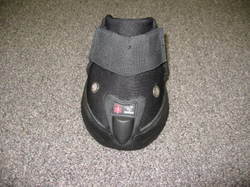 The intended use for this boot will be on laminitic horses that could already have elevated hoof temperatures. We definitely don't want our new design to exacerbate any hoof problems. I did a simple temperature test today with an indoor/outdoor thermometer. The thermometer takes one temperature reading from the unit and a second from a probe on the end of a long wire. 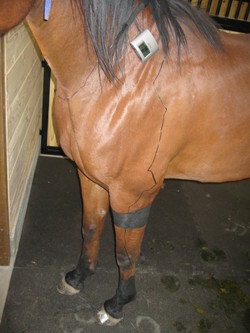 I taped the probe to the hoof, ran the wire up the horses leg and vet wrapped the unit into the mane. The readings were taken in a shaded barn out of the sun. 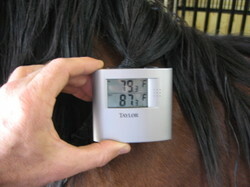 After getting everything set up on a non booted horse, outside air temp ranged between 79 and 81 degrees Fahrenheit. 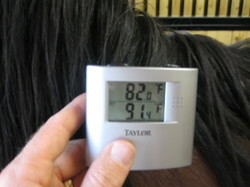 Hoof temp ranged between 87 and 88.5 degrees Fahrenheit. These temps stayed constant over a 20 minute period. 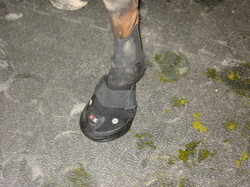 Next, I fitted one of the new EasyCare Med/Therapy boots over the hoof and temp probe. Air temp ranged between 80 and 82 degrees Fahrenheit. Hoof temp slowly climbed from 87 to 91.4 degrees Fahrenheit over a 40 minute period. After removing the boot, hoof temps quickly returned to the original 87-88.5 degree ranges. I'm going to do a similar test over the weekend outside in exposed sun. In addition I'm going to walk the horse to see if the air vents remove more heat. The Easyboot Medical/Therapy boot is almost complete. We made a couple changes and tweaks to the last design and are very happy with the results. The major changes were improvements to the three air vents located at the front and rear of the boot. We also improved the upper fastening area to be a double lock system that flexes with leg movement. There are some other great medical therapy type boots on the market but I believe the EasyCare Medical/Therapy boot will offer the following advantages. 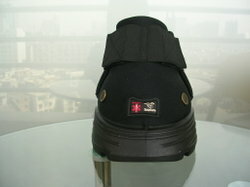 First, the upper is completely padded against the hoof and lower leg of the horse. 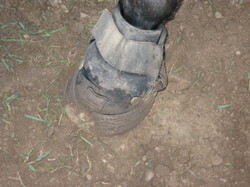 Second, the air vent system allows the hoof and lower leg to breathe without dirt and debris entering the boot. Third, the fastening system is secure but flexible. 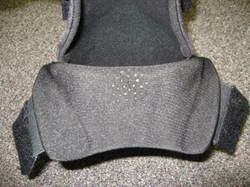 Next, the boot will include an EasyCare Comfort Pad. 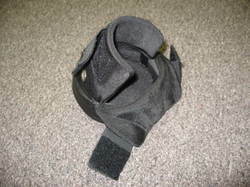 Additional comfort pads or different comfort pad densities can be purchased for an affordable $12.00 per pair. We intend to distribute some samples to our Hoof Care Practitioner dealers to help with final testing. Release dates will depend on the final testing results. The boot is intended for the following applications. 1. Cushion, protect and support the hoof during episodes of laminitis. 2. Keep the hoof injuries clean and dry. 4. Protection and comfort during transportation.